For those that attended any of my talks in the last few years or bought my Forecast DVD (a few copies are still available), you know how on target I have been. First: about the fake media. 3 CNN reporters were forced to resign. One of the stories cited, was identical to the forecast I made that false accusations would be put on Russia as being responsible if a power grid went down in the U.S. This exact event happened in Vermont and is referred to in the Intercept article. It bears repeating, because I see so many people walking around like zombies still reciting the ridiculous stories – if you see it on mainstream news, and it is a story that is repeated over and over with no visible or cited evidence, there is a high probability it is propaganda. Next, The New York Times retracted its ‘fake news’ story about ‘17 Intelligence agencies’ having confirmed Russian hacking. Now they say it was only 4 – (which is still false, because only three exist.. the other is an oversight body). The astrology of this repeated phenomenon is the square between Saturn (reality) and Neptune (illusion/TV/film). In many ways, as a result of people being “plugged in” and “on line” both terms referring to the loss of critical thinking and having one’s thought processes being manipulated by targeted news stories, it has become difficult for the average person to separate truth from fiction. Note, I said the ‘average’ person. In these times, it takes all of us stepping up to be above average and begin to question down to our very roots what is going on around us. There is no responsibility from the networks to tell the truth. None whatsoever. You are getting infotainment if you use one of the major media outlets as a primary source of news. Are you going to stick your head in the sand when the truth comes out regarding a ‘fake’ news story on the mainstream media or will you wake up, join in and look for the real truth? My Alternative News CD source will give you dozens of sources other than these from which to learn the vastly different truth of what is happening in this country and around the world. Contact me to get a copy. But it takes leaving your usual go-to sources. A little effort will go a long way to enlighten you and stimulate your brain cells to some real stories that will surely challenge your preconceptions about the world. We all collectively determine the future – so don’t sit back – participate! We need you! 7/8/2017 – Additional stories posted below that came out subsequent to the posting of the above post. WHAT CAN ASTROLOGY REALLY TELL US ABOUT RELATIONSHIPS? A PRACTICAL GUIDE. Based on Certified Consulting Astrologer DIANA BROWNSTONE’s interview with VOGUE’s ARIANA IONESCU. What’s New With The Planets in May 2017? What’s Going on in May? After all the retrograde planets in April (four!) frustration from stalled projects and endless waiting is finally subsiding. Venus went Direct (April 15th) affecting personal relationships – now getting back on track. 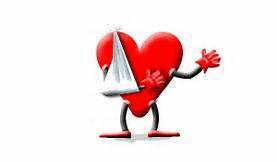 Financial setbacks, also related to the recent Venus Retrograde, should have begun to sort out as well. Mercury was retrograde until May 4th – and is now direct. During Mercury Retrograde our attention is drawn to the importance of details, communication, and of keeping technology up to date and backed up. Mercury leaves the shadow (ending the retrograde cycle) on May 21st. Last week’s full moon in Scorpio may have brought on some outbursts of emotion because it also coincided with Uranus (havoc/impulsiveness) conjoining Mercury (communication). Are all your relationships still intact from that planetary fiasco? We are now getting the first glimpse, from the political news stories, of the theme of the major eclipse that will fall right across the U.S. on Aug. 21st. Recently the nodal axis has been crossing that same zodiacal degree (29 degrees Leo/Aquarius) the past week where the eclipse will occur. As I mentioned in my workshop last October (see video), the 29th degree of Leo is also Trump’s Ascendant/Descendant axis. The stories in the news now will come to a head at the August eclipse time – and we will (hopefully) find out the truth to all the ‘Fake News’ (Saturn/Neptune) stories about Russia as well as what is really going on behind the scenes with Trump, the FBI, North & South Korea and many other global issues. And an easy guess as to who is hacking into the world’s computer systems is seen by noticing none of our financial systems or stock trading has gone down…yet. A test-run perhaps? I spoke all about the deception in the media correlating with the Saturn/Neptune square as well in my Forecast workshop. Clues are on the major TV shows if you know where to look! On a positive note, Saturn, now retrograde – provides us with our last opportunity to restructure areas of our lives where Saturn is now transiting in Sagittarius. Yes, there is always some good that comes with Saturn’s influence to help us structure and discipline wherever we are lax. A reading will clarify on which area(s) to focus to get the most of this last retrograde before Saturn moves into Capricorn in December. The next Expo in N.Y. is not until October, so if you missed my last workshop, and don’t know what’s coming down the pike, get the DVD of the workshop see preview below of the video to get up to speed on the coming drastic Economic Indicators in the Planets. Already 40% of Citibank’s cash machines have gone off-line. Buy 1 DVD and/or accompanying CD/Booklet “Practical Preparedness to 2020 & Beyond” and get an organic seeds starter pack free! What a deal! Contact Diana to purchase the 1 hr. 40 min. long video on DVD & the accompanying How To Prepare Info CD. With last Monday night’s new moon in Aries we passed the midpoint of the Venus Retrograde. Last Friday, Venus swapped places with the Sun in its path and became a morning star, rising above the horizon ahead of the Sun. While Venus as a night star is more synchronous with love and poise, Venus the morning star (and especially in Aries, the ram) is bringing our fiercest temperaments out of dormancy. Relationships and friendships are being challenged and many are breaking up, as people seem to be on the verge of losing it’ over just about every tiff. But it isn’t just Venus in a less than agreeable sign now, because Mars, the other relationship planet, is in its most obstinate and least progress-oriented position – Taurus. Mars wants to move ahead and accomplish things, while Taurus wants to languish in the pleasure (or annoyance) of the moment and find reasons to stay put exactly where he is right now. It is easy to get caught up in these negative patterns now.. so try to make time to sort out what is most important and what isn’t and let go of whatever energies you may be generating unconsciously that keep you from progressing. Now is the best time to get in touch with what you value and what to let go of that is standing in its way. Is it a better paying job? Self-respect? Being more creative? All of these come up for analysis now. With Venus and Mars in each others signs (mutual reception) there is always some good to come out of whatever difficult scenarios that may arise. In keeping with the Venus/Mars theme, after many years of keeping my readings at the same cost, I am now raising my rates and slightly modifying my policy. There is some good news along with this! Current clients and subscribers (or if you are reading this blog April 1-8) you may book a session at my old rates by contacting me by April 8th and secure the session by paying in advance by April 15th. Unless you are a consistent returning client, I require payment in full before all readings. PayPal users now pick up a (small) PayPal fee to use the system. You are always welcome to pay by check or money-order to avoid the few extra dollars. I look forward to seeing many of you in the coming months to keep you centered along your path and knowing the astrological climate ahead before it arrives. What does it mean when Venus is retrograde? In a nut shell – the things Venus stands for can either go awry or come back into your life to be reassessed during this part of Venus’ cycle. This year from March 6th to April 15th Venus will be retrograde. – Reassess who the person/object is and decide what relevant value they had in your life. Now is a good time to appreciate what you learned or gained from the relationship. Resolve the past, let it go, and move on. On occasion, this cycle can bring back a relationship that will remain in your life – but that would depend on numerous factors being present in your chart . – Do not get attached to the past – this is a cycle for review. Although Venus is retrograde in Aries, the sign of beginnings, now is NOT the time to jump into a new relationship. The person will only present part of the picture when around you or communicating with you. This may not be deliberate – but you still will not see the entire scenario you may be getting involved with. You will not see their entire motivation, nor know the safety of the situation. This includes intimacy – you don’t know the person’s past yet, or who they fully are, so play it safe and wait. This is not the time to make a big purchase – because if you are impulsive, you will spend more than necessary, and may regret the purchase later. Objects of art, a new home, anything to do with décor or beautifying yourself (haircut/color, cosmetic surgery etc.) will all not turn out as planned. Either more research needs to be done on your part, or the information you are getting is not complete. You may have a different aesthetic than the person selling you the surgery, the haircut or the porcelain vase – so you will need to be cautious. I knew someone who went into a photo shoot and the photographer decided to touch-up all the photos before showing them to the client. The photographer made the client look 18 when they were 40, so none of the photos could be used! Different aesthetic = expensive lesson. Another person bought an apartment during the retrograde, and it wasn’t until the sale was nearly complete and the scaffolding came down across the street that they saw their view was a real eyesore – a hot pink awning. They ultimately did not complete the sale and lost most of their deposit. In purchases, often at this time, someone needs to sell something and you get to buy it at a much reduced price! Someone gets the short end of the stick.. so let it be the ‘other’ person! It is a good time to go to estate sales, yard sales, and sales in general. As long as you heed the advice that you may buy something and change your mind once you get it home, and not overspend, you can get some great buys during Venus retrograde. Other things you can expect are for money to be delayed that you are counting on, or surprises with money and partnerships. Review what you value and your personal values during this cycle. You may find a job is not up to par with your more confident self-view at this time. If that is the case, take action to look for a new job. The same in relationships. While fighting during this retrograde may be productive, find out where you may not be feeling valued in the relationship and communicate that and move to make alterations. Put yourself first, but not to the extent that you turn off everyone else. Try not to be impulsive. Venus in Aries makes us all a little more feisty and assertive, so walk away from non-productive arguments. Unsure of a new love? Think you should break up? Get a new job? A look at your chart can clarify in what area(s) exactly what is happening in your life with the Venus retrograde.Contact me and let’s see whether Cupid or Venus Retrograde is stirring the pot in your life. This Spring there is a terrific speaker lineup including Richard Dolan, Eric Pearl, Dannion Brinkley, Sean David Morton, Marianne Williamson, and Dr. Joel Wallach joins Dr. Jane Goldberg, Dr. Chi, Dr. Cua, Dr. Paul Ling Tai, Dr. Eric Kaplan, Kat James and others to bring you the latest in alternative healthcare and proper nutrition. With all that has been happening in the news this previous year you will not want to miss the Saturday morning panel, on which I am speaking, along with host Sean David Morton and panelists Dannion Brinkley, Jill Dahne, Stephen Popiotek and surprise guest Duncan Cameron of the Philadelphia Experiment and the Montauk Project as we focus on Predictions for the next four years. The UFO Panel, which premiered at the last expo, was so successful that Richard Dolan is back to discuss disclosure on this extraordinary topic. These two panels along with the Strange Universe Panel, Vibrational Healing Panel and Nutrition Panel and the other 100 lectures at the expo rounds out the fantastic speaker program. There will be exhibitors from around the world with cutting edge information, products and services coming to enlighten us. Alimtox is back with their detoxifying foot baths, Crystal Tones with their crystal bowls and Momentum98 with their infrared saunas will join our 100 exhibitors in the “marketplace of the future”. And Inner Traditions is back with their half-price bookstore. I will be available for readings throughout the weekend on the balcony. Contact me now to reserve a time for your session. See you at the Expo! That is where we are – between 2 eclipses. Eclipses come in cycles and this month we had a Lunar Eclipse on Feb. 10th and will have the subsequent solar Eclipse on Feb. 26th. It feels as if there an electric current building up all around us. In the chart for the Solar Eclipse Pisces above, you can see the exact conjunction of Mars and Uranus. These two together make for action and rebellion with a now or never urgency. This is why we see so many people walking around angry and lashing out but perhaps aren’t feeling like they can make the impact they’d like. A Pisces eclipse brings to the fore the subliminal and psychological with a good dose of helpless victimization in it. Jupiter (which magnifies things) is aligned with the eclipse and the Mars/Uranus – Pluto square. This is an extremely volatile combination that puts us on edge. The energy feels electrified and out of proportion to what can be handled. Try not to lash out! 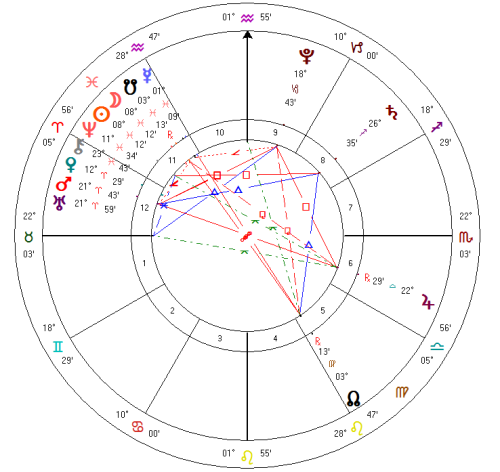 If you’ve attended my lectures and/or reading this blog, you know all about the rebellion of the Uranus/Pluto square, this eclipse and that this chaotic and revolutionary energy is being stirred up. The best use of this eclipse is to transmute what is happening into strong subconscious focus. Raise your personal energy to find the best way to manifest the outcome you’d like to see in every area – your personal lives, the political trajectory and in the world. What has been happening in the U.S. has not suddenly changed by the new Administration. The system has been setup to bypass the people and to a great extent the passivity of the public has allowed it to go this far. For those inclined to get involved, go local, get involved and reach out to those that represent you. On a personal level, try to put off major decisions until at least a few days after the eclipse. Get your rest, and solutions and rational thought will return. Feeling out of sorts? Contact me for a personal reading, or a single horary chart to get some objectivity on your situation. The heading of the chart above refers to Italy since Jan. of 2016. Most of the forecasts below have played out already. Stay tuned as the rest unfold. If you would like the complete video presentation of the 1 hr. 40 min. workshop “Navigate the Coming Economic Tsunami with Astrology”, contact me. Excerpts will be posted soon on my YouTube channel. “Trump has a huge following and even with the flipped votes for Hillary, he is way ahead. They will make it very hard for him, and will do everything possible to not let him get in. He will have many (legal) battles and opposition before and after the election.” Outsiders were also plotting against him – see what Project Veritas exposed. Here is a concise critique in The Intercept of the fake news about Russia from Pulitzer Prize winning Journalist Seymour Hersh. “Precious metals (gold, silver, etc.) will go up so fast you may not be able to get in at a low.” Get in on precious metals before they spike. Because the dollar is less popular and being outright refused by some trading nations, having investments in tangible items such as precious metals, art, food etc. and property is more favorable. For those that don’t understand why PM’s haven’t been able to take off yet – In the early part of January, the gold and silver futures market was developed and implemented for the sole purpose of manipulating the PM markets to keep the American people away from acquiring physical gold and silver. Read, see videos and get educated here. And here. For my Practical Preparedness pack with all sorts of information and tips, contact me. 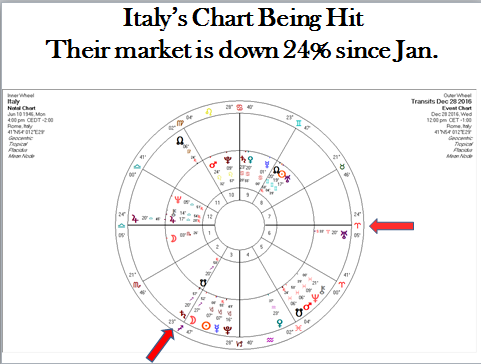 “Italy’s chart (see chart above) is shown to be the next country to be hit with a financial crisis.” Uranus is now on the Descendant nearing 24 Aries. Within a couple weeks following their impending default, expect the financial chaos to travel to neighboring countries as well as the US. Already in the UK, banks have increased the notice time from 24 hours to 48 hours when withdrawing over £2,500. This is to make it harder to pull your money out quickly and to prevent a run on the bank. “The Barbault Index, the indicator for global and societal rises and falls, makes its first move of its steep decline from 2017-2018.” This augurs worldwide issues, lacks, and setbacks. The US Stock Exchange and the US dollar are very inflated and will not continue to remain inflated indefinitely. Prepare accordingly. See this interview. If you would like suggestions on how to prepare, contact me for my Practical Preparedness CD/Paper which includes specific steps to take physically, financially and practically. The rich are prepping – shouldn’t you? “Electrical grid outage will be blamed on Russia or China – or labeled an EMP – Electra-magnetic pulse.” This has already happened in Vermont when it was falsely reported that Russia hacked into the US electric grid. This so-called “hacking” will likely occur again this year as a means to make changes to the financial system. The grid outage will likely be timed to coincide with the bank bail-ins (when the banks take your money/accounts to get out of debt) in Europe. Prepare by having stored food and especially water as these will be gone in the first couple hours of a blackout. You will need cash to buy things as ATM’s and credit card machines will not work. Have enough cash for anywhere from three days to two weeks worth of food and water. Gas may be difficult to get or purchase without cash if at all. If bank bail-ins occur here, and you have a savings account, you are considered an investor in the bank and your money will be taken to pay bank creditors. Savings holders are last on the list to get their money back. If you can’t afford to lose your savings, get it out of the bank and hold a couple months’ expenses in cash and invest in precious metals and/or property. 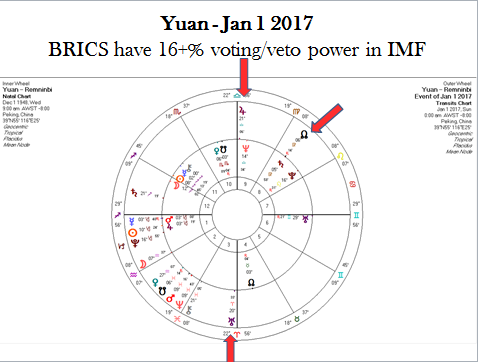 “The Yuan gets 16+% voting power (and veto power) in the IMF on Jan 1 2017 which is the highest percentage of any nation now (surpassing the US).” See chart below this blog. “Feb 11th Lunar eclipse hits on the angle of Russia’s chart and Putin’s chart. And on the Feb 26th Solar Eclipse Mars joins Uranus in Russia’s chart in the house of global partners or aggressors. Actions taken will have permanent repercussions.” My forecast regarding Putin’s role in the global community goes back to my 2015 lectures you can see on my YouTube channel. I will add more videos soon. Will this eclipse hit your birth chart? Find out if this is a crucial period for you too by having an update. – Do not take offered vaccines in the coming year until you have seen Vaxxed or the Vaccines Revealed series. Vaccines are both tested and promoted by the same body; a for-profit corporation. Many videos series and films have come out to explain how there is a lack of data showing efficacy for any vaccines. Unless you subject people to an actual condition in a control group, no vaccine can be deemed able to prevent anything. – Every planet goes through Climate Change – and we are heading into a very COLD period. Not. Warm. COLD. – Consciously take care of your health now. The corporatized health and medical industry is interested in their bottom line – money. – Learn how to protect yourself against Depopulation and why it has been used for decades against the people. Educate yourself about the global depopulation policy – how it is carried out through additives to your food, plastics, vaccines, chem-trails etc. Join the CGC (Center for Global Consciousness) by contacting Kevin Galalae the expert who will send you his research. I have been speaking about the Saturn Neptune square for the past couple years – all about the shift in reality and the undermining of the truth – way before the fake news meme came about. There is a grand illusion that has been played on the population through film and TV – the illusion and manipulation of this powerful medium to keep us in the dark. See my blog post a few posts down for more on this transit, or contact me to get copies of my lectures where I explain this transit in depth to understand how this has been done. I will be speaking on the Strange Universe panel at the upcoming New Life Expo along with Sean David Morton, Richard Dolan, Marianne Williamson, Dannion Brinkley and many others. Full schedule of speakers for March will be coming out soon. Need an update on your chart for the coming year? Contact me here.